There are two main ways that beer can become wine inflected: the use of its ingredients, or the use of its barrels. Most wines are fermented or aged (or both) in wooden barrels, the majority made of oak. The interaction between the oak and the wine gives rise to sweet vanilla flavours and tea notes, buttery flavours and hints of wood. It’s an essential part of winemaking in developing the flavour, texture and colour of the wine. By contrast, most beers are fermented in stainless steel tanks with no opportunity for chemical interactions. However, there are several breweries experimenting with the ability of wood to transform their beer. Firestone Walker is a partnership between Brit David Walker and California-born Adam Firestone. It was Adam’s early days growing up on the Central Coast of the USA, surrounded by his family’s vineyards, that led him to brewing, with his nascent ventures taking place on winemaking equipment. The brewery’s Barrelworks wild beer program, located in Buellton, California, pays homage to these young days, allowing the brewery to explore a place where grape meets grain. All beers brewed here are aged to some degree in used American, French, Italian, or Hungarian oak barrels that have either been previously used for wine making, or, in the case of the American oak barrels, used for beer. “Barrel character brings a new variable of depth to the final product,” says Jim Crooks, master blender and Barrelworks manager. “It can be used as a nuance or as a main component in blending. Oak can be aggressive or mild depending on what aroma or flavours you are trying to highlight in the blend.” Barrelworks is home to over 2000 wine barrels and 18 wood tanks all filled with beer in all different stages of maturation. When most breweries refer to oak or barrel-fermented beer, they’re referring to beer primarily fermented in the wooden vessel. That is, wort is poured into the barrel with a dose of yeast and even bacteria, and left to undergo primary fermentation there. Foeders and puncheons can also be used. A second method is to take beer that has already been fermented in stainless steel, and transfer it into wood for secondary fermentation and aging along with more yeast, bacteria, and possibly other fruit to make the magic happen. This is called ‘refermented in the barrel’ or ‘secondarily fermented’ or ‘aged on fruit in the barrel’. 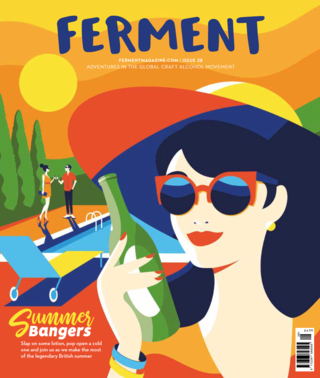 A third option is to add just wort to a wooden vessel, typically a foeder, and let naturally present bacteria and yeast drift down from the air (or from the wood itself) to ferment it, in the same time-honoured way that Belgium’s Lambic producers do. Almost always, these methods are used for sour or wild beers. Barrel-aging poses plenty of risks for your typical brewer. Very small amounts of oxygen flow through the wood in a process called micro-oxidation, which can overpower the nuances of a beer. The dark, moist, oxygen-fuelled environment of their inside layer provides a perfect home to organisms like Brettanomyces, which feed off the tasty sugar in the wood. Indeed, Brettanomyces growth is one of the reasons winemakers have to retire their barrels after a period of time. For re-users of wine barrels, unless the effects of Brett are desired, barrels must be cleaned out thoroughly to minimise bug build-up. It can be a losing game, however, since microorganisms can infiltrate the wood up to a depth of almost a centimetre, which no amount of cleaning product or sanitising solution is going to reach. Grapes aren’t usually seen in brewing, but their involvement has gone from being experimental to a sure bet. Bruery Terreux has been a leader in this realm of hybrids. “Yes, we use a lot of grapes!” says Jeremy Grinkey. “We do co-ferments with wort and grapes (whole cluster), and finished sour beer and grape juice for re-fermentation. These types of beers are near and dear to our hearts.” Across the pond, Brosé from Beavertown in London sparkles like a ruby, thanks to the 400kg of Pinot Noir grape skins that are added per brew. This beer was dreamt up by former lead brewer Ben Turley, who had been nurturing for some time the desire to create a drink “that dims the border between beer and wine”. Brosé was conceived when Forty Hall Vineyard - the first commercial-scale vineyard in London since the Middle Ages - offered up 1.5 tonnes of their grapes, or rather, 1.5 tonnes of grapes post-pressing. The skins that Beaverton took home went straight into the mash, imparting their rosy hue and tart fruitiness to the end result, a crisp, dry beer that has the “distinct character of lingnonberry,” according to Beavertown (points to them for knowing what a lingonberry tastes like). Barrelworks also employs grapes extensively, sourced locally within a 30-mile radius of their site, including from the family vineyards. Over the years it has used many methods. Its first wine/beer hybrid was called Lil Mikkel, first brewed in 2011. 600lbs each of Sauvingon Blanca and Chenin Blanc grapes were de-stemmed, a process that ruptures the skin on the fruit but leaves it intact. The grape skins and juice were then added to a sour beer at the end of secondary barrel fermentation, re-inoculated with Brettanomyces and Lactobacillus, and left for another year. “From this process, we learned more about the flavours that are derived from fermentation on grape skins,” says Jim Crooks. “We chose to eliminate the skins from all future processing due to off flavour of methoxypyrazine, commonly identified as green bell pepper, negatively influencing attributes of the beer.” From there, the team experimented with adding just juice to unfermented beer, and using grape pomace. Other examples include Magnolia brewing’s Rosebud, a marriage between an English grain bill, a Belgian yeast strain, rosebuds, lavender and pressed Cabernet Franc grapes; Social Kitchen’s Saison Du Sauvignon, which takes advantage of the delicious grapes of its California locale; and Sixty One from Dogfish Head in Delaware, its best-selling 60 Minute IPA with just one extra ingredient: syrah grape must. If grapes are experimental, then lees are next level. Lees are to wine as trub is to beer, that is, they’re the dead yeast and other solids left over from fermentation – a thick, nutritious liquid the consistency of milkshake. Normally they’re removed for aging but some wines, like champagne, are matured ‘sur lies’ for added nutty, savoury aromas thanks to their complex mix of yeast, bacteria, tartaric acid, polysaccharides, and protein-tannin complexes. Dan has also made a sour weisse on lees: a pink, vinous, Berlin-style sour wheat beer. The lees are used within a day of racking, while still fresh and vigorous, and often impart some flavour and colour from the wine itself. Dan feels their ingredients and methods blur the modern distinction between beer and wine. “We’ve recently released Sauvignon Sour, a sour blonde ale made with Sauvignon blanc grapes and dry hopped with Hallertau blanc. We’ll also soon release a sparkling ale fermented with champagne yeast and finished with hibiscus flowers and grapefruit peel,” he says. Another British example is Kent-based Chapel Down winery’s Curiouser & Curiouser Chapter 1, a limited edition 4.9% sour ale blended with Chardonnay and Bacchus lees, launched under the Curious Brewery label. Chapel Down topped the lees with sour beer from Wild Beer Co. and left the combination settling in barrels for six months before blending and bottling. 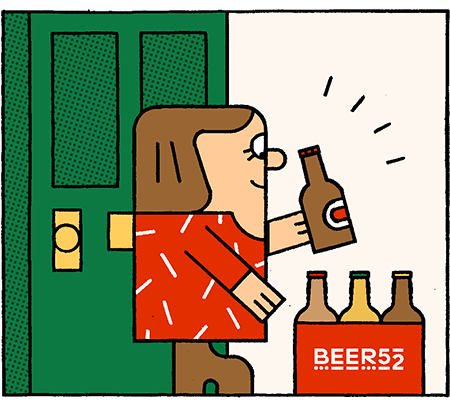 In a sense, the relationship between beer and wine has come full circle over the centuries. Having parted company into two completely distinct categories of booze, the grape and the grain are once again furtively flirting like distant cousins at a family wedding. Rather than producing gimmicky, wine-flavoured beers though, brewers are painting with a palette drawn from every stage of the wine-making process, finding new ways of working with these complex and versatile ingredients and giving us, the discerning beer lover, entirely new and eye-opening flavour experiences.